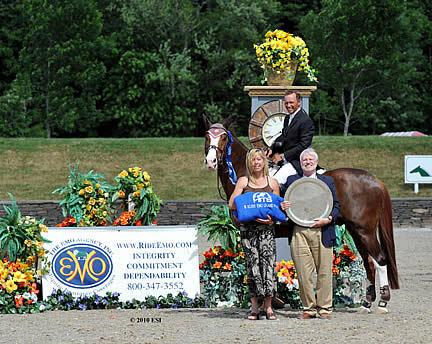 SAUGERTIES, NY (June 1, 2010) — The $50,000 EMO Grand Prix, presented by Pfizer Animal Health, was the perfect stage as Pavarotti, with Todd Minikus in the irons, took home the win in Sunday’s class to highlight HITS-on-the-Hudson I.
Minikus and Little Annie were the first of 30 horse-and-rider teams to take to the field designed by Olaf Petersen, Jr. of Paehl, Germany. The team had a rail down on the second fence, which would also prove troublesome for four other riders in the first round. Following Minikus, the first of five clean rounds in the class came from Michelle Spadone and Coco, owned by Redfield Farm LLC. Spadone, of Califon, New Jersey, also went clear on her second mount Melisimo, owned by Morgan Hill Partners, giving her two rides in the jump-off. At the end of the challenging first round which saw several riders retire, both Robert Kraut and Graf Lando, owned by Meghan Moran Kraut, and the winner of Friday’s $25,000 HITS Grand Prix, presented by Pfizer Animal Health, Margie Engle on Indigo, would join Minikus and Spadone in the jump-off. “Five clean out of 30 is the perfect number,” commented Minikus. Spadone and Coco showed first in the jump-off setting the pace with four faults in 40.822 seconds, which in the end was good enough for a fourth-place finish. With the momentum of Friday’s win, Engle took over the lead, setting the Great American Time to Beat at 40.687 seconds in her double-clear effort. Kraut was next in the irons, slipping behind Spadone with four faults in 44.271 seconds for a fifth-place finish. “Bob [Kraut] was fantastic and Margie looked really quick, so I figured she would be the one to beat,” said Minikus. Minikus and Pavarotti took the field with their sights set on the win as the team took over the lead with no faults in a fast 39.333 seconds. “I had to put on the gas pedal,” said Minikus, who had no time to rest as he tried to best Engle’s pace. Spadone and Melisimo returned for the final round of the class as they raced to a nail-biting finish, which saw the team come within a hair of the win. However, their time of 40.204 was not enough to take the lead from Minikus, so they settled for second, while Engle and Indigo finished in third. © ESI Photography. HITS' Account Executive Corporate Sponsorship Lisa Engel and Senior Vice President Tony Hitchcock present the award to Todd Minikus and Pavarotti. 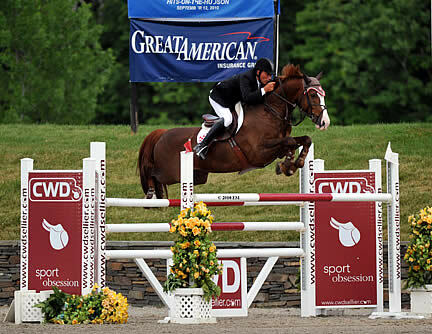 Minikus and Pavarotti have no plans on slowing down, as the duo will continue to compete in Saugerties throughout the spring and summer in order to qualify for the Pfizer Million. The road to the Pfizer Million continues as prize money increases and High-Performance riders gear up for HITS-on-the-Hudson II (June 2 – 6), which will feature two more Pfizer Million qualifiers with the $25,000 HITS Grand Prix, presented by Pfizer Animal Health, on Friday, June 4 and a $75,000 HITS Grand Prix, presented by Pfizer Animal Health, on Sunday, June 6. In order to qualify for the Pfizer $1 Million Grand Prix, a rider must compete in eight or more HITS Grand Prix classes. The top 40 riders, based on money won by horse/rider combination, will be eligible to ride for the Pfizer Million. For more detailed information on the Pfizer $1 Million Grand Prix, please visit our website at www.HitsShows.com. HITS, Inc. produces high-quality, international-level hunter/jumper horse shows. Based in upstate New York in the village of Saugerties, HITS has been producing shows since 1982 and is now a nationwide company with world-class circuits in California, Florida, Arizona, New York and Virginia. In 2010, HITS will take the industry to new heights when it hosts the Pfizer $1 Million Grand Prix in Saugerties on September 12. For more information and a complete schedule of classes and events, visit www.HitsShows.com. Media should contact the HITS Media Team at 845.246.8833 or e-mail Media_Info@HitsShows.com.